Although some Colonial legislatures and governors still acted as judges in colonial America—the Massachusetts legislature actually had the title “General Court”), a judiciary branch emerged early and with it a typically American system of justice and law. American lawyers, later epitomized by Abraham Lincoln, were often self-trained and learned on the job. 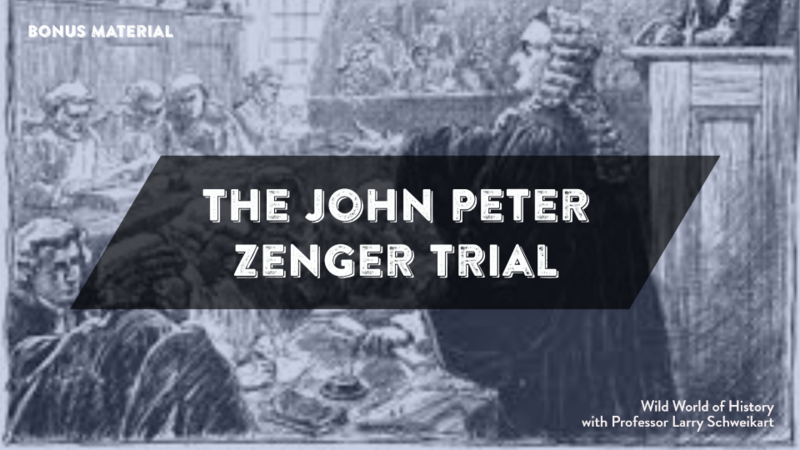 The case of John Peter Zenger was typical of the American legal system. His victory set a precedent for what would later be termed “freedom of the press.” Zenger turned British libel law on its head while simultaneously attacking the power of an arbitrary Royal governor. Born in Germany in 1697, John Peter Zenger emigrated to New York in 1710. Fervently religious—the Dutch Reformed Zenger played the organ each week in church— he learned the printing trade and in 1733 set up his own newspaper, the New York Weekly Journal. Zenger’s paper formed a political counterweight to the supporters of Governor William Cosby, whom Zenger viewed as an enemy of legislative power and the forces of democracy. Biblical principles undergirded Zenger’s material. He diligently committed himself to “speaking and writing Truth,” and viewed governors who abused their power as “not Gods but dead Idols.” Soon, a newspaper war began between Zenger’s Journal and a pro-Cosby paper, the New York Gazette. The debate heated up as Zenger and his fellow editors severely lampooned the Governor and the royal administration. Outraged at attacks by a lowly newspaperman, Cosby ordered Zenger arrested and charged with seditious libel. It should be noted that in this earliest instance of newspapers, neither was committed to publishing the “news” or even the truth, but rather both were political organs designed to support or attack a person or political group. In other words, they were early versions of Buzzfeed and Dan Rather. Authorities held Zenger incommunicado for ten months before bringing him to trial in 1735. In this landmark libel case Zenger was represented by a brilliant jurist, Andrew Hamilton (no relation to the Revolutionary hero). In order to win, Hamilton had to pursue a radical course of overturning centuries of precedent in English libel law. According to English law, a person could seek judgment for libel so long as he could prove that his reputation had been harmed. Note, this “harm” did not necessarily hinge on “truth”—thus a person could be libeled even if someone was telling the truth about him! In other words, all that was necessary to win in a seditious libel case in England was to prove harm, not the falseness of the libelous comments. In the end, the jury broke with English law and acquitted Zenger. Governor Cosby and his supporters were outraged. The verdict had the practical effect of overturning English legal precedent of reshaping libel law. Christian editors started to see their role as challenging corruption and injustice: within a year of the Zenger decision, William Parks of the Virginia Gazette assailed the Virginia House of Burgesses for corruption, and when threatened with prosecution, he invoked the Zenger defense. Charges were dropped. Thus, the Zenger case paved the way for what Americans would come to embrace as “freedom of the press,” but, ironically for many modern Americans, only on the grounds that what was printed was true. The important immediate result of the Zenger case was to rebuke an authoritarian royal governor and provide further evidence of the democratization of American politics and government. Frank B. Latham, The Trial of John Peter Zenger, August 1735; an Early Fight for America’s Freedom of the Press (New York: Watts, 1970). Quotations by Zenger appear in Marvin Olasky, Telling the Truth: How to Revitalize Christian Journalism (Wheaton, Illinois: Crossway Books: 1996), 110, and his Prodigal Press (Wheaton, Illinois: Crossway Books, 1988), Zenger’s quotation on 107.